We wish to apologise to all of you for your negative experience at the recently concluded Enrique Concert. Although both of us were overseas fulfilling cricket commitments, we were shocked and saddened to hear of the events that transpired. It is extremely disappointing for us that this event, organised to assist the development of Sri Lanka as a tourist and entertainment hub and provide the public with exceptional entertainment of a high standard by accessing celebrated international artists, turned out in this manner. We are issuing this statement today, after understanding all circumstances and the facts. When the idea was pitched to us and other investors by the organisers to bring an artist such as Enrique to Sri Lanka, we backed it in all good faith expecting a stellar event delivered in a professional manner to the public of Sri Lanka. Although we realised that such a venture will be an arduous one due to the well-known challenges and market restraints of organising such large-scale events in Sri Lanka, we were willing to support this endeavour considering the rich experience and the image-building potential for Sri Lanka’s tourism. As such, all required resources – both financial and otherwise – were made available to the organizers to ensure the desired outcome. Unfortunately, the event has fallen far short of these expectations. Although we believe that the organising team worked tirelessly and with good intentions to ensure a well-run event, there have clearly been glaring mistakes made, for which responsibility needs to be taken. Firstly, although the delay of the artist and some equipment arriving at the venue, which caused the subsequent delay in opening the gates to usher in the public, for which the artist responsibly and graciously apologized, was beyond the control of the organizers, the communication of this to the public was mishandled, thereby inconveniencing people greatly. Those that stood patiently in-line for hours were not extended the courtesy of being informed of the ground situation. This at the very beginning would have frustrated and angered all of you. Secondly, although a professional security company was hired and protocols were put in place to ensure the safety and the comfort of all, we have been made well-aware that these measures were inadequate when faced with the challenges of controlling such a large gathering, and failed alarmingly. 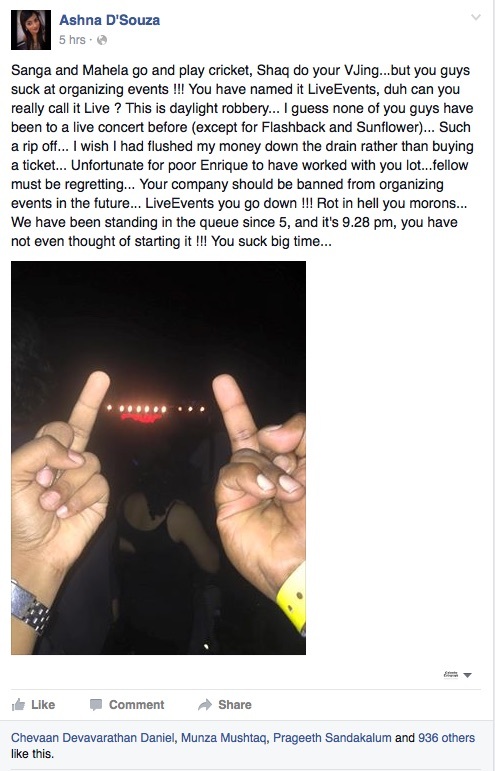 This obviously undermined the overall experience for those who purchased premium tickets by their respective space being encroached upon by others, and we fully understand their disappointment and anger. The premium price paid by them for their tickets needs to be respected and their comfort and viewing experience should have been safeguarded, which is under the direct purview of the organizers. The organizers are in agreement, with our direction, that such shortcomings must not be tolerated. As such, we have informed them that an apology in itself is not sufficient, but further appropriate compensation has to be made in the form of a suitable refund, irrespective of the financial loss to us. With regards to recent reports concerning Live Events and Municipal entertainment taxes, we categorically state the company remains transparent and ethical in all operations. Live Events will continue to ensure full compliance with all relevant tax commitments and is providing all necessary information to the Colombo Municipal Council, in order to clarify facts and the way forward. Accountability and integrity is paramount to us and we believe it to be the same for the organizers. Although we know an apology or refund cannot fully satiate your disappointment, we wish to reiterate that we remain fully committed to all of you and our country. As such, a full and thorough internal inquiry is ongoing into all areas of concern.